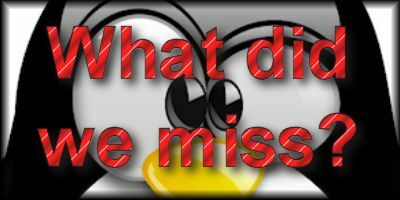 Slap The Penguin: What did we miss? The first story that comes to mind is more of a non-event. The Mayan Apocalypse was due to hit us just a few days before Christmas 2012. The ancient Mayan empire was considered to be the leading civilization of their day with their hyper-accurate astronomical charts rivaling anything that NASA had come up with prior to the first moon landing, which gave them an uncanny knack for creating calendars. Given such a wealth of knowledge, who would doubt their prediction that life as we know it would come to an end towards the close of 2012. People laughed at Harold Camping and his Judgement Day prognostications, but the Mayan's were an advanced race of superintellectual South Americans, not some whacked out bible basher looking for 15 minutes of fame. After the world failed to end on December 21st 2012, people shrugged and wondered why they were still alive and living on Earth. I did some digging and found a few facts about the Ancient Mayans which may shed a small ray of light on why things didn't end as planned. Possibly the biggest reason that we are all still here is the fact that we miscounted how many days we had left. The Mayans believed their thumbs to be sacred. The opposable digit which separated them from the animals was highly revered and as such was never used for anything menial, like counting. Because of this, the Mayans counted only on their 8 fingers and worked in Octal or Base-8 system, not the decimal (base-10) system that modern man is familiar with. A simple decimal to octal converter shows us that the year 2012 in fact becomes 3734 when not counting on your thumbs. 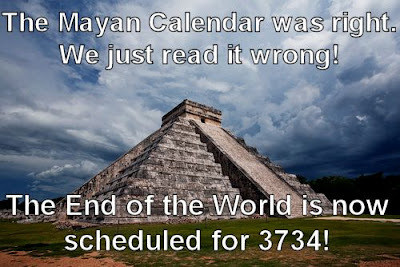 The Mayan Calendar is correct, the world will end, we just got the date wrong by 1722 years! The only other world shaking news story to happen in the last 3 months came from the Vatican. Pope Benedict XVI quit after almost 8 years, getting out narrowly before the crazy Easter schedule began. This meant that a new Father of the Catholic Church had to be found in a hurry. Millions of devout followers packed St. Peter's Square in the Vatican awaiting the white smoke, which signals the appointment of a new pontiff. 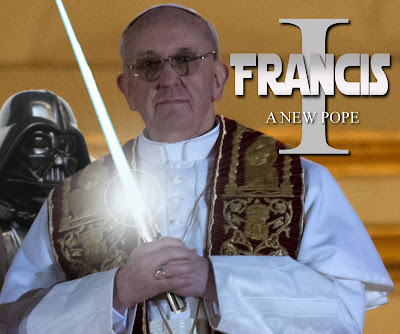 Eventually their patience paid off and the announcement came on 13th March 2013 that Jorge Mario Bergoglio of Argentina was elected and will be known as Pope Francis. "Now who is who's Father, Vader?" Thanks for reading. Like us, follow us, share us... the tools are below.